Aguamar Bungalows are situated in a very peaceful area only 350 metres from Migjorn beach. Nestling in the countryside just behind the Talaya bungalows, they are ideally located to enable you to enjoy this beautiful part of the island. All of the properties have air conditioning. The interior style is simple and basic with all that is needed to provide a comfortable holiday home. There is swimming pool where guests can sunbathe and relax. Each one bedroom bungalow has a separate bedroom and sleeps up to 3 adults or 2 adults and 2 children. Twin beds in the bedroom. Twin sofa beds in the living area. Spacious living room with kitchen area. The Real Playa restaurant with fantastic beach and sea view is situated on the dunes as you arrive at the sea from the bungalows. More beach bars and a selection of restaurants are located close by along the length of Migjorn beach. 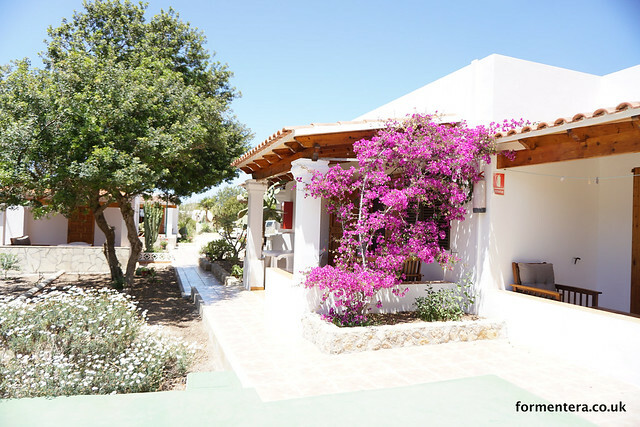 Shops, a small supermarket, restaurants and a bus service linking the villages of Formentera are only a 10 minute walk away in Ca Mari. San Fernando is only 2.5 km from Aguamar with a number of banks, cafes, restaurants, shops and larger supermarkets available.